Designing a kid's room from scratch can seem like a daunting task, but it can be so much fun too. Having curated my son's room over the past few years, I thought I could share some of my stories and key tips for a Scandi-style kid's room. I know it sounds like a cliché, but kids grow up so quickly... I actually think Harvey may end up taller than his six-foot-three dad! He is growing so quickly, and he sometimes has the attitude of a teenager. I am sure you all know what I am talking about. 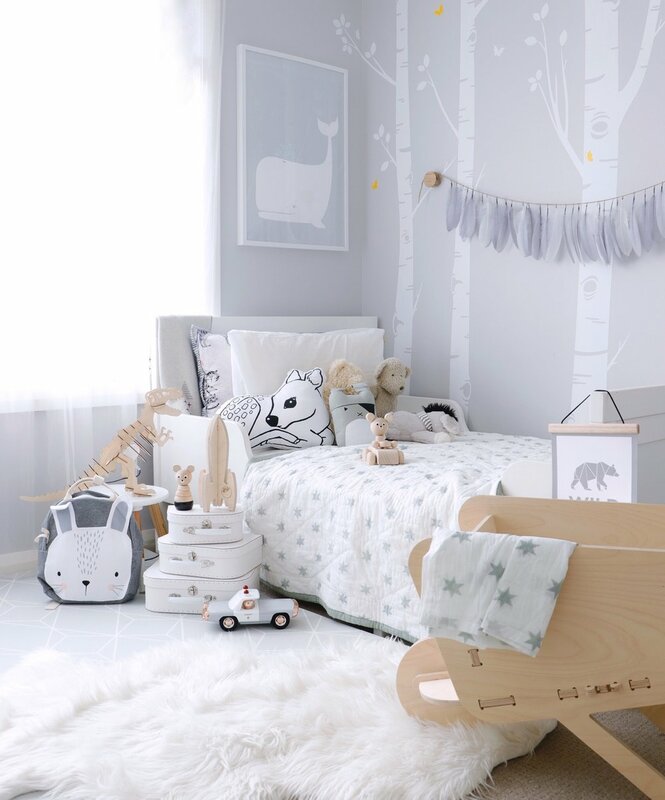 So make sure you keep that in mind when deciding on a room theme and design - it should continue to evolve over the years as your little one grows. For our Scandi room, we painted all the walls in a cool grey that will never age. We decided on feature wall decals of a classic winter Scandi forest to add a unique element, which can be easily be peeled off when he grows out of them. We are lucky as this room gets plenty of natural light so we’ve included sheer curtains to allow the natural light to filter, and a block out roller blind for sleeping. As a typical boy, our little man loves dinosaurs. I still laugh when I think about the time I was flicking through Insta, and Harvey was peering over my shoulder. All of a sudden he let out an almighty roar, I nearly spilled my coffee all over my lap! I realised he was looking at a really cool pic of a wooden dinosaur light. So yep... I had to get it for his birthday a couple of weeks later. As difficult as it can be sometimes, you don’t want to fill the room up too much - a cot and nursing chair take up quite a bit of space especially if the room is small. When it was time for the cot and chair to move out, we opted for an extendable bed which will grow with him. It also means he has room to make a lot of mess. So much mess! Actually... maybe we should fill it with more furniture to stop that, now there’s a thought?! There are so many cute Scandi themed prints available, at very reasonable prices. I'm always switching prints around as I style his room for photos, it keeps it fresh and changing. I am not sure how much he actually notices or appreciates it, but at least I do. White and wooden frames are definitely my favourites. A question for all you mums out there - last September my husband put up a Richmond Tigers Premiership poster on Harvey’s wardrobe door.... when am I allowed to sneakily rip that down, surely it's time? Lots of beautiful wooden toys have been added to this room, they are all such good quality and will last forever and hopefully be treasured and passed down to the next generation. Our Write to Me baby book is always on display with my favourite memories and photos and often features in my photos, along with many other treasured items. In keeping with the Scandi theme we have a beautiful set of wooden drawers jammed packed with, yes you guessed it, lots of white, grey and black clothes (I can get a little Scandi obsessed, I know). A shelf is always a great idea for storing books or for the little trinkets you don't want small hands to touch, lots of keepsake storage boxes or toy boxes can help to hide toys away and our wooden wheelbarrow is great for storing books or blankets.